The attractive Dutch Renaissance-style Rosenborg Castle was designed by King Christian IV and served as his home until he died in 1648. Today, the castle is an important cultural institution and acts as a public museum detailing the history of Denmark's royal family. It also acts as a repository for the Danish Crown Jewels and royal regalia, which are kept in the castle cellars and can be viewed by the public. The castle's treasures are arranged chronologically by era, allowing some insight into the history of the monarchy. Although opulent, the castle also feels surprisingly personal and intimate for a royal residence. The magnificent castle gardens are a welcome retreat from the city's hustle and bustle. 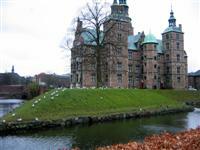 The Rosenborg Castle will delight anybody interested in the royal family or the history of Denmark. Transport: Bus routes: 14, 42, 43, 184, 185, 5A, 6A, 173E, 150S, 350S. Opening times: January to May: 10am to 2pm. June to August: 9am to 5pm. September to October: 10am to 4pm. November to December: 10am to 2pm Tuesday to Sunday. Times can vary month to month and at certain times the castle is closed on Mondays so be sure to consult the website for specific dates. Admission: Entry to the gardens is free. The castle: DKK 110 (adults); children under 17 free.